What’s up with Google AMP? 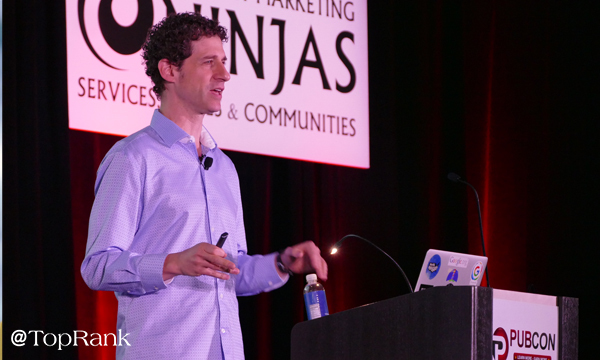 That’s what a room full of marketers were determined to find out on Thursday’s Pubcon Pro session with Google’s Developer Advocate, Ben Morss. In his session, Ben outlined the current state of Google AMP, why marketers should care, and how it can work along with PWAs (progressive web apps) to deliver a seamless, fast and immersive experience. 53% of users abandon a site if it takes longer than 3 seconds to load according to a Doubleclick study of Google Analytics Data. One additional second of load time can lead to a 3.5% decrease in conversion rate and a 2.1% decrease in cart size according to a Radware report. The message is clear — people will leave your site if it’s slow, which leads to fewer conversions. And of course, Google uses loading time as a ranking factor. It’s in the best interest of your business to focus on page speed as a key objective, if not for your rankings than certainly for your customers and prospects. Ben also emphasized that AMP was created to help improve the look and feel of surfing the mobile web. Sure, you can create a dull, featureless website through AMP, but it’s not recommended. The sites that have the best success using AMP are ones that utilize AMP HTML, AMP JS and AMP Cache. This allows for exciting, interactive design experiences that load quickly. A PWA is a progressive web app – it provides an app-like experience on the web. It should be fast, integrated with the device, reliable, and engaging. Like the mobile web, PWAs have a lot of reach and are discoverable anywhere. And like an app, PWAs have a lot of power, and are a user friendly experience. If you do a PWA the right way, Ben says, you get the best of both worlds. So, what are the benefits of PWAs? You can use an app shell for fast transitions. The shell loads before the content, and dynamic content then populates the view. Users have the power to add the PWA to their home screen like an app for easy access, without having to download an app. PWAs can provide a full screen experience on mobile and on desktop, similar to an app interface for a more immersive experience. Users can opt-in to push notifications, though Ben cautions that we should use those notifications wisely. Using AMP helps users discover the content through AMP search results, and have a seamless page loading experience. The content is delivered quickly. Then, when they click in to additional pages, they’re upgraded to the PWA experience to continue to browse. This helps not only deliver content quickly, but provide an engaging experience throughout the browsing process. Can this be done without AMP? Certainly, according to Ben. Does that happen often? Definitely not. The reason being that it’s common for developers to inadvertently slow loading time by adding additional script elements or files that aren’t optimized – he even admitted that it happens at Google. AMP helps reduce that risk. You can go to amp.cards to see a demo of the AMP to PWA experience. It’s worth a look! Note – it works best in mobile. Did you miss Pubcon Pro this year? Or just want to revel in the glory of what was? Check out the rest of our Pubcon Pro live blogs here.